Independent playtime has such value to your child. Your child will learn to focus, build a longer attention span, gain creativity, become adept at self-play, and be more orderly. 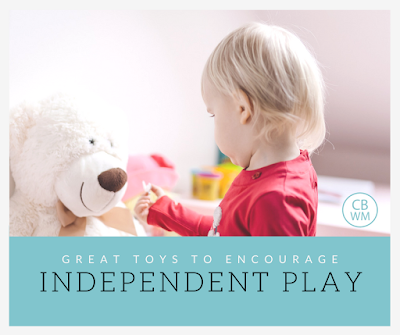 It is so very worth the effort it can take to get started with independent play. You might be wondering which toys are best for your child to play independently. Are some better than others? 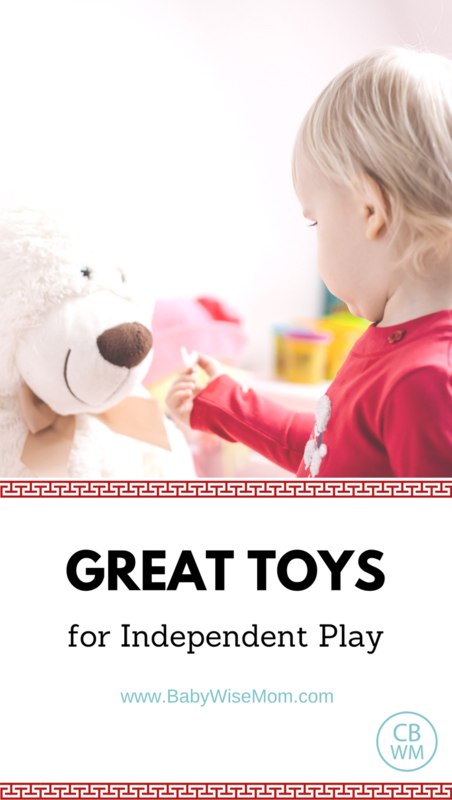 Here is a list of my favorite toys for independent play to get the most out of the time spent. This post contains affiliate links. Another great category of toys to go for with independent playtime are toys that help the child mimic real life. This is a huge benefit of playing in general, and will really help your child gain orderly skills (as will requiring your child help clean up at the end). Dress up clothes. Toy kitchen and accessories. Doctor set. Vet set. Note on the dress up. If you hit the Halloween stores and sections at stores the day after Halloween, you can find some good deals on some dress up clothes. Some toys are difficult for the child to play with. What happens when the child plays with that toy with you around? He/she asks you to do it or to help. When the child is in independent play, he/she has to do it herself. This helps with attention span and being able to play alone. Do not overwhelm your child with difficult toys. Do not leave your child alone with toys that are too hard and not developmentally appropriate. You don’t wan to to completely frustrate your child. Puzzles, magnet dolls, geomags, train sets, and nesting cups are all good examples of hard toys. I also love some musical toys going on. I am very musical and love to foster that in my children. I think it helps them with their creativity and attention span. Books are a fantastic item to have with your child during independnet play. I have a lot of posts on best books by age. Here are some. One I always loved for independent play with my little ones are the VTech books. They read to the child. I also like soft books. My children play independently, without me, daily. For help on getting this started with your children, see Roomtime–Your Invitation and Starting Independent Playtime Late.